Are you a content creator in need of a professional, distraction-free space to put your ideas onto paper? 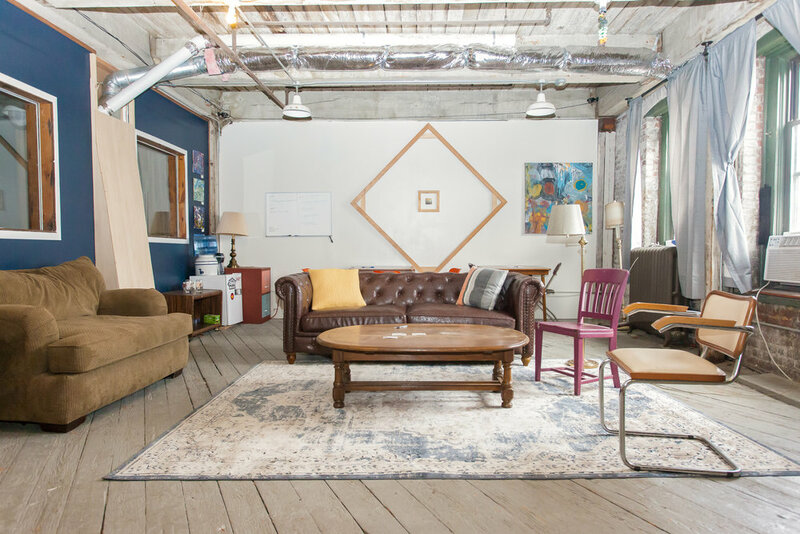 Our secluded office space is an eclectic hub where creativity can thrive. Whether you are editing a script or looking for a common space to collaborate in, our office membership program proides unlimited access to comfortable couches, desks/writing tables, high-speed internet, and complimentary refreshments. Every month Barrel of the Bottoms' office space transforms into a cozy indie performance venue featuring a variety of talent from Kansas City and nationwide. We want our office space to not only inspire creativity, but to also showcase it. Stand up comedy, music, spoken word, circus acts, and more have made their way to our stage. Check back regularly to see what events are coming up! If you're interested in podcasting or stand up comedy, there's a good chance you've considered improv classes. Improvisation lends itself amazingly to both art forms, and BotB wants to help you build on that skill with our weekly classes. Every Thursday evening from 7:00-9:00, local improv seminar teacher Patrick Craft will guide the session to have fun and build your quick wit. Free for office members and $10 for all guests.